Irene is a researcher in the Systems Research Group. Her research focuses on operating systems and distributed systems. Irene completed her PhD in 2017 at the University of Washington, where she was advised by Hank Levy and Arvind Krishnamurthy. Her thesis covered distributed systems for applications that span mobile devices and cloud servers. Before her PhD, Irene received S.B. and M.Eng. degrees from MIT. 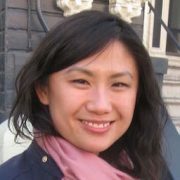 Irene was born in Beijing, China but spent most of her time growing up in Columbus, Indiana. She and her husband cook, travel and occasionally do computer science together.